Agatha Christie stayed there. So did T.E. Lawrence, King Faysal from Iraq and General de Gaulle: at the famous Hotel Baron in downtown Aleppo, Syria. At that time, Aleppo was an exotic and cosmopolitan city where Arabic, Turkish, Kurdish and Armenian cultures coexisted. 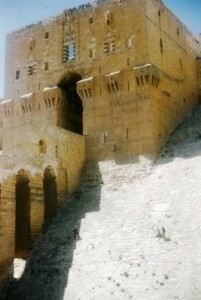 A photo of the Citadel at Aleppo taken by Nicole Logan in 1957. The medieval citadel, with the most impenetrable “glacis” ever built in history, dominated the town. 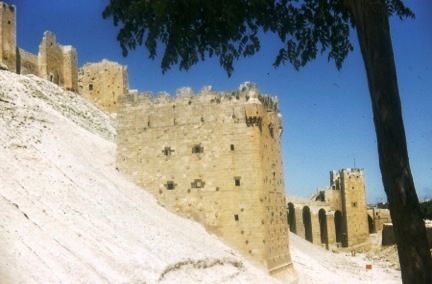 Aleppo was a bustling place, which I was able to witness first-hand during a drive from Ankara to Beirut in 1957. Vienna was just a comfortable train ride away on the Orient Express as early as 1913. But all this was before the Syrian civil war. Another photo of the medieval Citadel — now partly in ruins after repeated bombings — from the author’s 1957 trip. Aleppo, like many other historical Syrian cities, is being crushed by daily bombings. The devastation is concentrated on this region with the intent of cutting off the road to the north toward Turkey. Today the Bab el Faraj – one of the main squares – is in ruins; the 11th century minaret of the Omayyad mosque lies on the ground among fallen stones; in July 2015, a bomb placed in a tunnel destroyed part of the citadel. The second largest metropolis of Syria is now a pile of rubble. Enard’s rambling style, oozing with culture, takes the reader from Austria – the outpost of the West on the edge of the Ottoman empire – to the Middle East. Besieged by Suleiman the Magnificent in 1529, Vienna was threatened for the last time by the Ottoman Empire in 1683 in its final effort to flood the Danube valley. Refusing to draw bitterness from the century-long tug-of-war with the Turks, Franz the hero of “Boussole” believes in cross-pollination between the Western and the Oriental worlds. As a musicologist he is able to detect in the works of Mozart, Rimsky-Korsakov, Schoenberg or Debussy, the influence of Arabic music’s harmony with its microtones and absence of tonal structure. 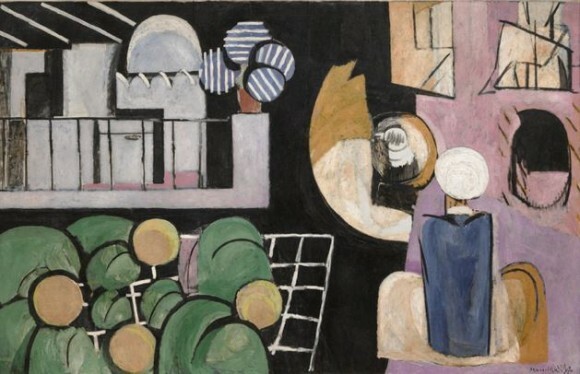 “The Moroccans” by Henri Matisse. There has long been a tradition of literary and artistic attraction by the West toward the Orient. But it is Napoleon Bonaparte’s military campaign to Egypt (1798-1801), which opened the floodgates and made the 19th century West smitten with the Orient. And so were French poets like Chateaubriand or Arthur Rimbaud. Painters found inspiration in the Arabic world of North Africa or the Levant. 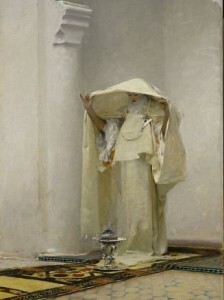 John Singer Sargent’s 1880 “Smoke of Ambergris” – the emblematic jewel of the Clark museum in Williamstown, the 1909 Vassilly Kandinsky’s “Improvisation 3” and Matisse’s “The Moroccans,” are but a few examples of the East and West symbiosis. At the present time Aleppo is at the epicenter of an imbroglio of violence and destruction and caught in the middle, tragically, are the refugees. Why do we not take a brief pause and return to a more peaceful time when wars and religious intolerance were not destroying societies?